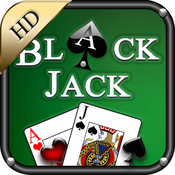 The best blackjack app for your iPhone/iPod Touch or iPad and Android phone. 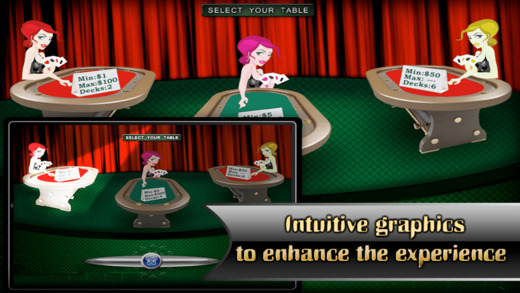 Play your favorite game – Blackjack in real casino environment. Realistic and intuitive graphics further adds to the experience. Three tables to chose from depending on your risk taking abilities – the minimum and maximum bet varies along with the number of decks. The third table is for the high-rollers with no upper cap on maximum bet. Nice casino style sound and music added. Shuffling after half of the hands played. Card counting can be done. Split option available if the initial two cards are same. Double down option available if you wish to double your bet after seeing the first two cards. Hourly Free Bonus Chips – The more you play, the more you get. 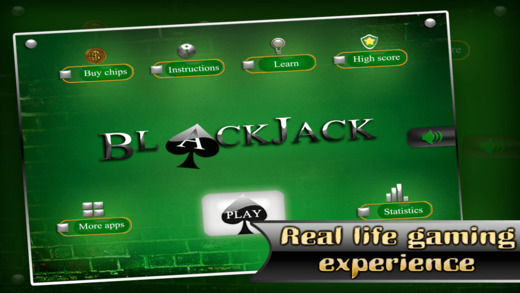 Learn section which has everything you need to know about blackjack. This can be used by a beginner as well as advanced players. Leaderboard to boast your earnings! Blackjack, also known as twenty-one, is the most widely played casino banking game in the world. Blackjack is a comparing card game between a player and dealer, meaning that players compete against the dealer but not against any other players. Blackjack is played with one or more decks of 52 cards. The object of the game is to reach 21 points or to reach a score higher than the dealer without exceeding 21. The player or players are dealt an initial two card hand and add the total of their cards. Face cards (Kings, Queens, and Jacks) are counted as ten points. The player and dealer can count his own ace as 1-point or 11 points. All other cards are counted as the numeric value shown on the card. After receiving their initial two cards, players have the option of getting a “hit,” which means taking an additional card. In a given round, the player or the dealer wins by having a score of 21 or by having the highest score that is less than 21. Scoring higher than 21 (called “busting” or “going bust”) results in a loss. A player may win by having any final score less than 21 if the dealer busts. If a player holds an ace valued as 11, the hand is called “soft”, meaning that the player cannot go bust by taking an additional card; otherwise, the hand is “hard”. The dealer has to take hits until his cards total 17 or more points. (In some casinos, the dealer also hits on a “soft” 17, e.g. initial ace and six.) Players who do not bust and have a total higher than the dealer, win. The dealer will lose if he or she busts, or has a lesser hand than the player who has not busted. If the player and dealer have the same point total, this is called a “push” and the player typically does not win or lose money on that hand. 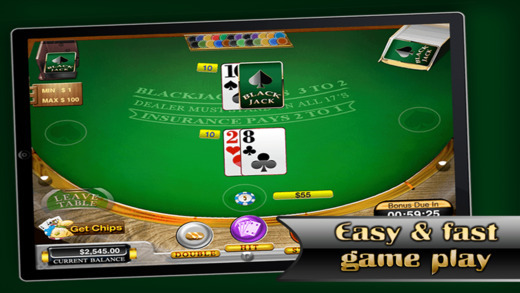 You can build the blackjack basic strategy by playing the black jack game on this app.